First off, I want to thank all you guys for leaving so many comments! It made me so happy to read all of those comments which were all cheering me on. One person said in a comment that I should identify the hand that you might see in some of my posts. Yes, sometimes my mom has her hand in the photo while I take the picture, but if you see a young 10 year old boy’s hand in the picture, it’s my hand! Last summer, my mom made a special kind of Jell-O called Sea Glass Jell-O. 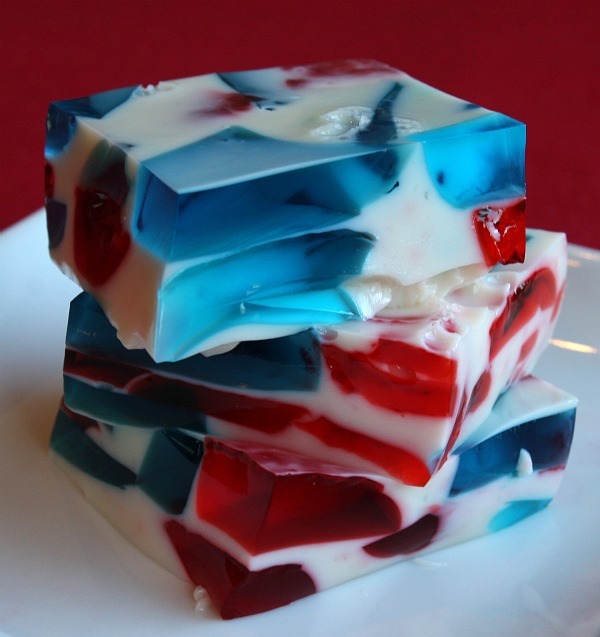 This was the recipe that sparked me to do my Patriotic Jell-O. 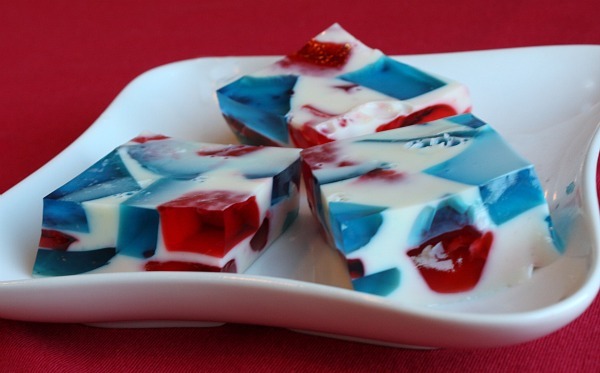 This Jell-O is a perfect recipe for summer barbecues and is fun to make with your kids. NO utensils required! Pick up a few and eat them with your hands! Look! 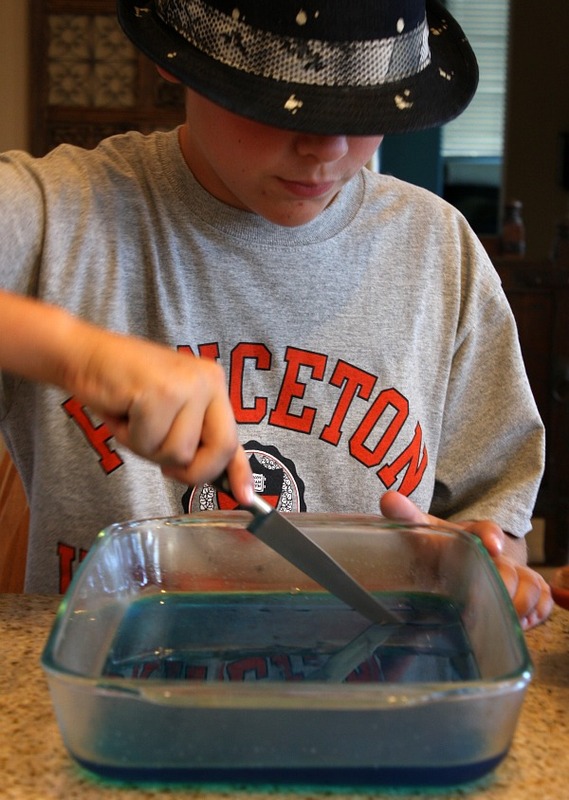 It’s me in my fedora and my Princeton shirt showing you how to cut Jell-O. 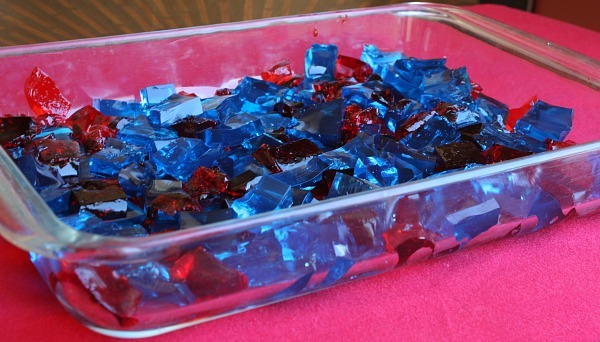 Cut the Jell-O into small pieces and scramble the cubes gently. My mom’s hand! Right now she’s pouring a sweetened condensed milk gelatin mixture over the Jell-O cubes. See how cool it looks?! Now it just goes in the fridge for a couple hours. When it turns into jiggly Jell-O, it’s ready to cut into squares (or rectangles). I think that all kids who like jiggly foods will LOVE this one because it’s colorful and everybody likes Jell-O, except for my best friend but this weekend I’m going to get him to try it anyways (no matter how much he protests). 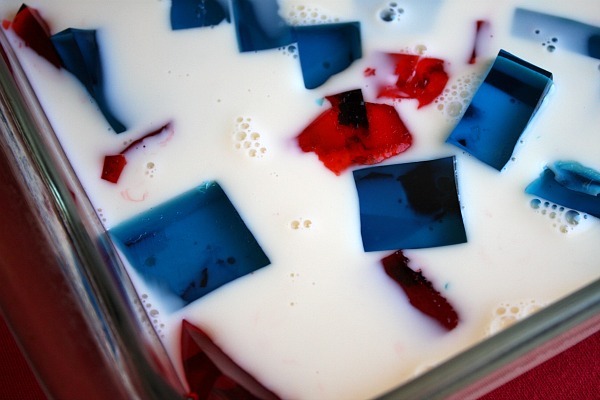 Have a happy Memorial Day weekend and don’t forget to make this very Patriotic Jell-O! 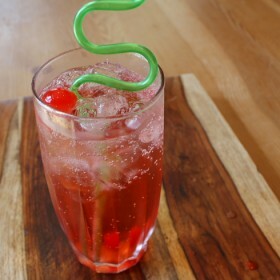 This is a really good recipe for parties on Memorial Day weekend or Fourth of July. Plus, it shows some real spirit for old Uncle Sam! 1. In two separate rectangular pans (9x13-inch is fine), sprinkle each box of Jell-O gelatin. Add 2 cups of boiling water to each pan. Stir until the gelatin dissolves. Put in refrigerator for at least 3 hours, until the liquid turns into jiggly Jell-O. 2. Cut each flavor into small blocks. Carefully mix the blocks in a 9x13-inch pan. 3. In a different bowl, sprinkle 2 pouches of unflavored gelatin into 1/2 cup of cold water. When the gelatin blooms, add 1 1/2 cups boiling water. Whisk it together until it dissolves. Add the can of sweetened condensed milk. Stir and cool. 4. 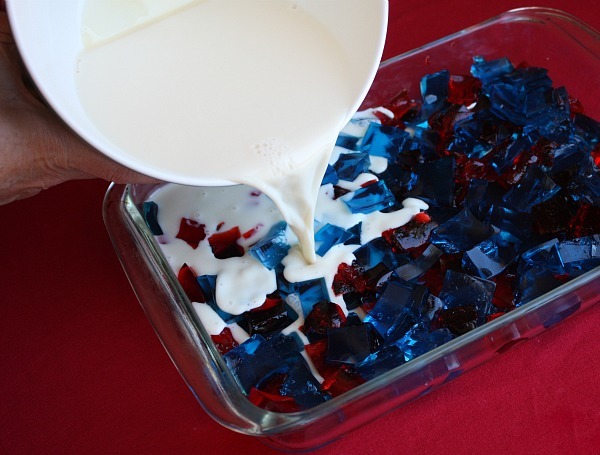 Pour the milk mixture over the Jell-O blocks and stick it in the refrigerator for at least 3 hours (or overnight). 5. Cut into squares or rectangles, and Bon Appetit. What a fun recipe! Perfect for this weekend too! Thanks for sharing! I am loving your posts! Very neat recipe!! thanks for posting! Thank you for sharing your recipe. I can’t wait to show it to my 11-year-old. I know he’d love to make it! What a fun recipe. I know my kids would love to make this with me. It could be their contribution to our Memorial Day barbecue. Way to go, Brooks! I’m having fun over here, waiting to see each creative new post you do! This is so pretty, so I’m going to to make it for our BBQ this weekend. Thanks for the recipe! Oh, and the fedora- it rocks! This looks sooo good! I’m going to make it for this weekend’s BBQ with family. Thanks, Brooks…can’t wait for the next recipe!!! Looks yummy! I’m going to expect you to cook for me on my next visit. Oh, this looks great! 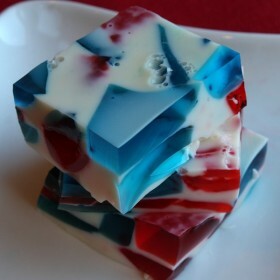 Making this for July 4! This looks like a lot of fun. My boys are a bit older, 15 & 16, but they love to cook. Can’t wait to show this to them 🙂 Thanks for sharing! So festive recipe boy! Love all the colorful pieces, nice work!! Happy Memorial Day Weekend!! Looks yummy and I love the idea to use different color combos for different holidays, party celebrations! I am off to give it a try…thankz! I love to see a young boy in the kitchen! Keep up the cool ideas and I plan on trying one of your recipies very soon! Love it!! Such a clever idea! Love it just reposted it on facebook! Hope you have a great holiday and summer! congrats on your blog! 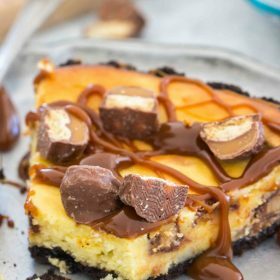 I love the colors in this recipe! 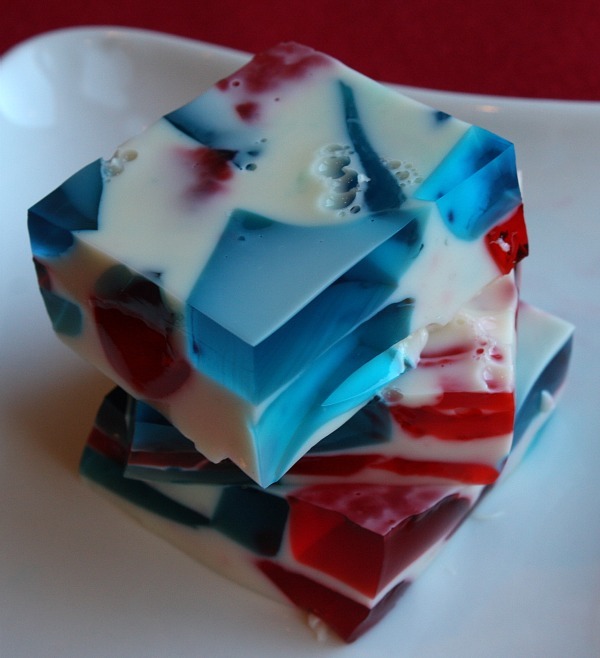 Great jiggly dessert for Memorial Day or 4th of July! Awesome! Saw Recipe Boy on tv today! How cool is that?! How cool! This looks like something my grandsons would love. They are 1 and 3. Can’t wait to try it with them for the 4th of July – thanks! Looks like RecipeBoy is doing great! Maybe you can teach me a thing or two next time I come to see you. How cool is this? I like seeing a man cooking in the kitchen, you go recipeboy. Love the post by your grandma..I am very thrilled to be a part of your website, and kudos to the women in your life..blessings, redraven. Thats so pretty, So many different ways to mix colors. I see you have planned to go to Princeton and your next Jell-O will be Princeton colors?? I like to know if anyone has tried this recipe. It looks great, and the condensed milk is interesting. I am making this for our Patriot parties this football season! I’m making these year-round! I’ll use green and red jell-o instead of red and blue!